Markets.com which is a trademark owned by Safecap Investment limited is one for the more known and experienced Trading companies in the market, they simply do their jobs, offer everything you require as a trader and let you trade with their support through a wide arrange of tools and services. *RISK WARNING: Trading CFDs carries considerable risk of capital loss. Markets gives their trader a trading leverage up to 300:1 and competitive spreads, and traders can start with just $100 they can deposit via bank transfer or credit card. New traders can set up their personal trading accounts within minutes and trade in commodities, stock, currencies, gold, equities, oil, and more than 2,200 contracts for difference (CFDs) including Crypto currencies. Markets.com Bitcoin Trading starts to take of putting them in the top of the market and thus in our list. Markets offers to their traders several different trading platforms: the WebTrader, Markets Mobile WebTrader, Native Android and IOS Apps, MetaTrader 4 + Tablet. All of these platforms are fully supported and you are able to check them out with your demo account. The trading platforms are conform today compatible with Windows, Mac, and Linux operating systems. Those who want to trade on the go can use the Market Mobile Trader platform that is compatible with Android, and iOS devices. Markets.com is owned by a publicly traded company, this does give them some larger overseeing,, regulatory entity and provides to the traders some additional insurance and assurance that everything will keep on working. And this makes this service provider a safe option for those traders that mostly worry about that. Traders can use a variety of payment methods to make a deposit on Markets.com. These include credit and debit cards (Visa, MasterCard or Diners Club), wire transfer, PayPal, Skrill (Moneybookers), Neteller and local payment methods. Withdrawals are very simple and relatively fast. The action that they need to take to place a withdrawal request are one of the more streamlined options we see in the market. All the trader has to do is log into their bank account and click on the withdrawal tab to have their funds transferred into their bank account. It really is that easy , wil take always a bit of time thou but atleast the trader will feel in controla and there is no extra charges for making a deposit or a withdrawal. Markets offers , email, and live chat support 24/5, and you can choose from 10 languages for support and 15 languages on the site itself. Markets Bitcoin trading is a safe bet , this is a safe service provider, there is nothing really that stands out in positive or negative and since people that want trade don’t really want to even feel their brand just have a good working platform for them to work on , this is actually one of the better companies to do that. The customers service people are friendly and know their stuff And a overall good available. Not a brand with large bells and whistles just go there to trade. 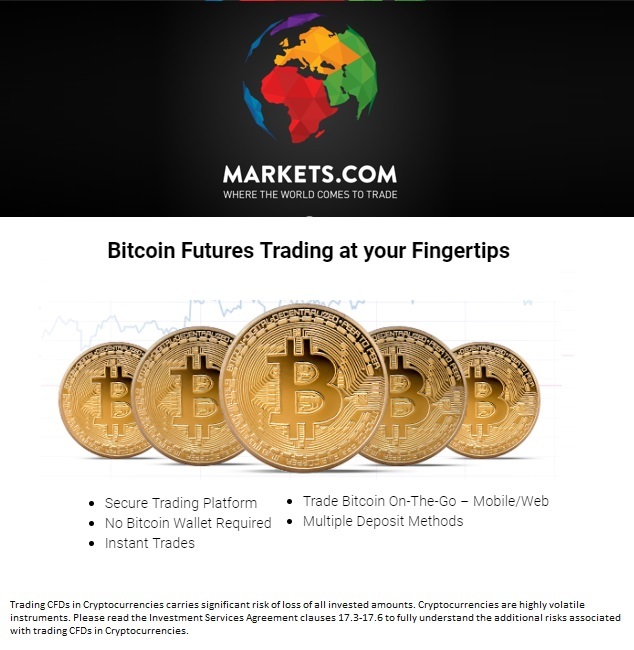 Markets.com profile | markets Bitcoin Trading. Markets Has been around for some time now and as a public company offers a solid , transparent and save trading environment.